Jumping into the ocean from your boat is great fun but trying to get back onto the boat is fairly difficult. Simply installing a stainless steel boat ladder to your boat will make a huge difference and encourage everyone to jump in and out of the boat. The best boat ladder is the RecPro Marine 4 with handrails, which is a heavy duty 316 stainless steel construction with a unique self supporting design. For durability and corrosion prevention, all boat ladders are constructed using stainless steel, including all the hardware associated with fitting it to the boat. Features such as non slips steps, handrails, telescoping design, swivel actions and mounting hardware are all extras that are found on the premium boat ladders. The type of boat you own will require a certain design or construction. Getting from the ocean to the boat easily and safely requires a sturdy ladders that is suitable for your boat. The number of steps or whether you need handrails are important factors that will make it harder or easier to get on the boat. There is a wide array of designs, constructions and types that will offer a helping hand to those trying to get back on the boat. Below is a list of the best boat ladders that are made from stainless steel and come with warranties. The RecPro Marine 4 is a heavy duty ladder for boats, which is used by many OEM boat builders when building high end boats and yachts. It is made using 316 stainless steel and has extra tall handrails for easier boarding on to the boat. It features a clever universal self supporting design, which reduces the need for tube stands offs that makes installation much easier. It is a heavy duty boat ladder with a weight capacity of 400 LBS and a 3 year limited warranty. Overall, the RecPro Marine 4 is the best heavy duty boat ladder with the sturdy stainless steel construction but you will need to use your own mounting hardware. The JIF Marine EQB4 Over Platform Telescoping Boat Ladder has 4 steps and is an electropolished 316 stainless steel construction with a 400 LBS weight capacity. It is 44 inches in length and 12 inches wide with a stowed length of 18 inches. The telescoping design has the ability to fold up completely onto the deck when not in use. Other clever design features include the flat poly treads to prevent your feet slipping whilst climbing onto the boat. Like with the RecPro, there is no mounting hardware, so its essential you purchase stainless steel hardware when buying this ladder. The JIF Marine is the best tall boat ladder and the easy fold away features make it easy to store when not in use too. Trying to get back into an inflatable boat is even harder because of the curvature of the boat. The Garelick provides a simple solution that hugs the hull for side boarding and attaches to the floorboards of the inflatable dinghy. It uses a vinyl sleeve that prevents any markings on the hull fabric and the ladder itself uses anodized aluminum tubing. There are 3 steps that are molded poly for extra comfort when climbing on board with bare feet. Overall, it is the best inflatable boat ladder to buy that won’t damage the hull fabric and make getting in and out of the ocean much easier. The marine graded boat ladders by Amarine-Made are constructed using 304 stainless steel with a telescoping design with 4 steps. On each step, there is a molded black vinyl tread for maximum grips and there is hinged brackets for easy installation. The full length when fully extended is 87.5 CM and it retracts all the way to 37.5 CM when not in use. It is 29.5 CM wide and can be used easily by larger adults. Overall, the Amarine-Made is the best cheap boat ladders with everything you would expect from the more expensive alternatives. Features such as 4 steps, non-slip steps and telescoping design are very desirable and not what you would expect from cheap boat ladders such as these. 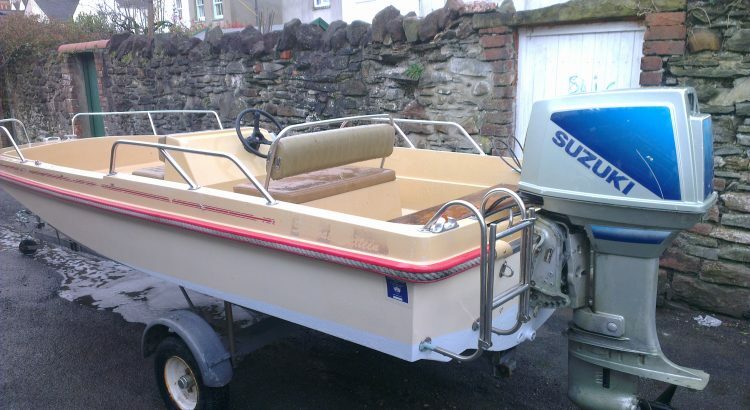 Not every boat will have the space for the standard style boat ladder and will require a thinner design. The Norestar is just 14 inches wide and 48 inches long with 4 steps and is targeted towards boat owners with limited mounting space. These boat ladders are constructed using 316 stainless steel and each step is wrapped in PVC non-slip treads. The mounting hardware are included and installation is fairly hassle free as it will fit most standard ladder brackets. For boats with limited mounting space, this ladder is the best buy. Although it does not have handrails or any side bars, the extra wide steps do make it easier to climb up the ladders. Jumping into the ocean and then back into the boat is particularly hard for the majority of people. Even if you do manage to get yourself back on board, 9 times out of 10 it is not achieved without any embarrassing maneuvers. Installing a ladder to your boat not only makes getting in and out much easier but its an easy win for increasing the resale value of your boat. Before purchasing the first boat ladder that you find, assess the requirements and mounting options. Below are some factors to consider that may change the option you choose. It would be pretty pointless having a boat ladder with one step as you would still need to awkwardly climb onto it. Three steps is usually the minimum amount required so that the majority of people are able to get onto it easily. The length of boat ladders is an interesting factor because many include a telescoping feature. This means you can extend it fully when in use i.e. swimming in the sea but also retract it fully to a smaller length to store it when not in use. Installing the boat ladder is much easier than you would think. By using the correct mounting hardware (always use stainless steel), you can attach a ladder to the boat with a few bolts and drilling. For boats that have limited space for mounting a boat ladder, its important you take note of the width measurement. Alternatively, the Norestar offers a unique installation with a single stainless steel mount required but this does mean you lose the handrails. Unless you are buying a ladder for an inflatable boat, the majority will be constructed using stainless steel. This is to ensure maximum protection against corrosion, ability to hold a lot of weight and of course be long lasting. In addition, many other features include handrails, telescoping length, non-slip tread on the steps and mounting hardware (it is not always included). If you are a large adult and feel the weight may be an issue, ensure that you check the weight capacity. Stainless steel boat ladders are relatively heavy duty and can handle up to 400 LBS, which should be fine for the majority of people. Avoid the cheap and nasty alternatives is highly recommended as they will really stand out (in a bad way). Investing into a stainless steel ladder for your boat will be more durable and look attractive as well as adding value. Boat ladders are universal and the only factor you really need to focus on is where you are able to mount the ladder.